The book of Romans clarifies the principle of justification, whether it is by deeds of the law, or by the work of God. The law has never been a means of salvation. Faith has always been the means of spirituality regardless of the dispensation. This epistle also helps us to understand how to have victory over the flesh. If we as believers walk according to our new nature, the inward man, we are controlled by the Holy Spirit and not the sin nature. 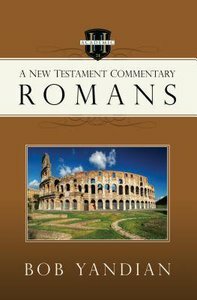 This New Testament Commentary is a verse by verse a verse-by-verse teaching of the book of Romans from the personal study notes of Bob Yandian. From 1980 to 2013 Bob Yandian was the pastor of Grace Church in his hometown of Tulsa, Oklahoma. After 33 years, he left the church to his son, Robb, with a strong and vibrant congregation. During those years, he raised up and sent out hundreds of ministers to churches and missions organizations in the United States and around the world. He has authored over thirty books and established a worldwide ministry to pastors and ministers. He is widely acknowledged as one of the most knowledgeable Bible teachers of this generation. His practical insight and wisdom into the Word of God has helped countless people around the world to live successfully in every arena of the daily Christian life. Bob attended Southwestern College and is also a graduate of Trinity Bible College. He has served as both instructor and Dean of Instructors at Rhema Bible Training Center in Broken Arrow, Oklahoma. Bob has traveled extensively throughout the United States and internationally, taking his powerful and easy to apply teachings that bring stability and hope to hungry hearts everywhere. He is called "a pastor to pastors". Bob and his wife, Loretta, have been married for over forty years, are parents of two married children, and have five grandchildren. Bob and Loretta Yandian reside in Tulsa, Oklahoma. Book jacket.